More and more homeowners are turning to tankless water heaters to heat their hot water. Even though these systems seem invincible you may encounter a problem or two with them. For example, inside each tankless water heater is a recirculation pump. Without this pump we could not get any hot water, in the event that this does happen, we want to introduce a pump that can help you get your tankless hot water system back online. This pump is the Grundfos RCP-96Ãƒâ€šÃ‚Â Recirculation Pump. Grundfos happens to be one of the largest manufactures of pumps for many different applications including residential hot water. Grundfos currently has over 10,000 employees working for their company in over 40 different countries. They are a name you can trust in. The RCP-96 is an open system UP Series Recirculation Pump that cannot only save you time but energy too. 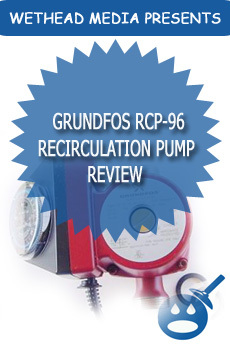 LetÃƒÂ¢Ã¢â€šÂ¬Ã¢â€žÂ¢s take a look and see what the Grundfos RCP-96 Recirculation Pump has to offer in way of features and specifications. Some of the benefits of the Grundfos RCP-96 Pump are the durable construction. This pump is made from bronze and stainless steel. The Grundfos Recirculation Pump offers a wet rotor design with a strong composite impeller. What happens with other pumps is that they become corroded from fresh water but the Grundfos RCP-96 was designed to get rid of all contaminants that effect the pump when fresh water is used. The Grundfos RCP-96 Pump is a 1-1/2 horsepower recirculator pump comes with a line cord and a timer. When utilized properly this pump can bring you hot water on demand but it can bring you many, many years of high quality and high performance. This recirculation pump is maintenance free and the best feature is that it uses very low energy consumption. This will save you money on your energy and electric bills. The RCP-96 is pre-programmed with usage times that will help you to design your own usage system, which will in turn save you money. This pump will bring you many years of service, dependability and high performance. The pump is an UPS15-55SFC Series Number. It comes with a 2 pole and a single-phase motor. The maximum water temperature for this pump is 230 degrees Fahrenheit and a minimum water temperature of 36 degrees Fahrenheit. With the Grundfos RCP-6 you will find that it has a flow range of 0 to 25 gallons per minute (US standards). The head range on this recirculation pump is 0 to 18 feet.Ãƒâ€šÃ‚Â The Grundfos RCP-96 uses 115 volts for operation but a 230 volt pum p can be ordered if you prefer. The maximum system pressure is 145 psi. You should check the requirements of your tankless water heater. 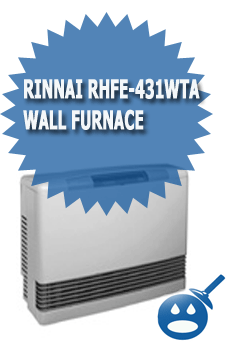 The RCP-96 is not compatible with all tankless water heaters. If you are in need of a new recirculation pump for your tankless water heater, the Grundfos RCP-96 can get the job done. This pump is high performance and high quality. Their products are built to last and they have a good warranty to cover them. 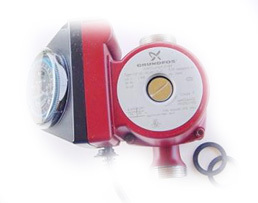 The pump with the Grundfos name carries a warranty for the original owner of the pumps. These warranties include protection in the case of defects or workmanship that is not up to standards. Of course they will not be responsible if the pump gets damaged from improper installation or carelessness. These pumps are designed with strong construction and quality components. If they are compatible with your tankless water heater then you can rest easy knowing that your tankless water heater has many years of quality service ahead of you. If you would like more information on the warranty or the company check out the Grundfos website, you will find everything you need. advise with the unit price / availability and lead time. Kindly reply back to our email.